Gluten (from Latin gluten, "glue") is a group of proteins, called prolamins and glutelins, which occur with starch in the endosperm of various cereal grains. This protein complex comprises 75–85% of the total protein in bread wheat. 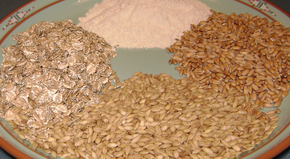 It is found in related wheat species and hybrids, such as spelt, khorasan, emmer, einkorn, and triticale); barley, rye, and oats as well as products derived from these grains such as breads and malts. Glutens, especially Triticeae glutens, have unique viscoelastic and adhesive properties, which give dough its elasticity, helping it rise and keep its shape and often leaving the final product with a chewy texture. These properties and its relative low cost are the reasons why gluten is so widely demanded by the food industry and for non-food uses. 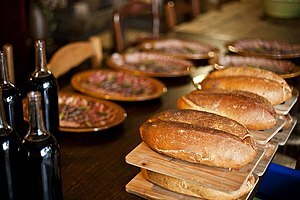 Gluten can trigger adverse inflammatory, immunological and autoimmune reactions and a broad spectrum of gluten-related disorders, including coeliac disease in 1–2% of the general population, non-coeliac gluten sensitivity in 6–10% of the general population, as well as,dermatitis herpetiformis, gluten ataxia and other neurological disorders. These disorders are treated with a gluten-free diet. Avenins cytotoxicity in celiac people depends on the oat cultivar consumed because of prolamin genes, protein amino acid sequences, and the immunoreactivities of prolamins which vary among oat varieties. Also, many oat products are cross-contaminated with other gluten-containing cereals. In home or restaurant cooking, gluten is prepared from flour by kneading the flour under water, agglomerating the gluten into an elastic network known as a dough, and then washing out the starch. Starch granules disperse in low-temperature water, and the dispersed starch is sedimented and dried. If a saline solution is used instead of water, a purer protein is obtained, with certain harmless impurities departing the solution with the starch. Where starch is the prime product, cold water is the favored solvent because the impurities depart from the gluten. In industrial production, a slurry of wheat flour is kneaded vigorously by machinery until the gluten agglomerates into a mass. [not in citation given] This mass is collected by centrifugation, then transported through several stages integrated in a continuous process. About 65% of the water in the wet gluten is removed by means of a screw press; the remainder is sprayed through an atomizer nozzle into a drying chamber, where it remains at an elevated temperature for a short time to allow the water to evaporate without denaturing the gluten. The process yields a flour-like powder with a 7% moisture content, which is air cooled and pneumatically transported to a receiving vessel. In the final step, the processed gluten is sifted and milled to produce a uniform product. Gluten forms when glutenin molecules cross-link via disulfide bonds to form a submicroscopic network attached to gliadin, which contributes viscosity (thickness) and extensibility to the mix. If this dough is leavened with yeast, fermentation produces carbon dioxide bubbles, which, trapped by the gluten network, cause the dough to rise. Baking coagulates the gluten, which, along with starch, stabilizes the shape of the final product. Gluten content has been implicated as a factor in the staling of bread, possibly because it binds water through hydration. The formation of gluten affects the texture of the baked goods. Gluten's attainable elasticity is proportional to its content of glutenins with low molecular weights, as this portion contains the preponderance of the sulfur atoms responsible for the cross-linking in the gluten network. Further refining of the gluten leads to chewier doughs such as those found in pizza and bagels, while less refining yields tender baked goods such as pastry products. Generally, bread flours are high in gluten (hard wheat); pastry flours have a lower gluten content. Kneading promotes the formation of gluten strands and cross-links, creating baked products that are chewier (as opposed to more brittle or crumbly). The "chewiness" increases as the dough is kneaded for longer times. An increased moisture content in the dough enhances gluten development, and very wet doughs left to rise for a long time require no kneading (see no-knead bread). Shortening inhibits formation of cross-links and is used, along with diminished water and less kneading, when a tender and flaky product, such as a pie crust, is desired. The strength and elasticity of gluten in flour is measured in the baking industry using a farinograph. This gives the baker a measurement of quality for different varieties of flours when developing recipes for various baked goods. Gluten, when dried, milled and added to ordinary flour dough, may help improve the dough's ability to increase in volume. The resulting mixture also increases the bread's structural stability and chewiness. Gluten-added dough must be worked vigorously to induce it to rise to its full capacity; an automatic bread machine or food processor may be required for high-gluten kneading. Generally, higher gluten levels are associated with higher overall protein content. Gluten, especially wheat gluten, is often the basis for imitation meats resembling beef, chicken, duck (see mock duck), fish and pork. When cooked in broth, gluten absorbs some of the surrounding liquid (including the flavor) and becomes firm to the bite. This use of gluten is a popular means of adding supplemental protein to many vegetarian diets. Gluten is often present in beer and soy sauce, and can be used as a stabilizing agent in more unexpected food products, such as ice cream and ketchup. Foods of this kind may therefore present problems for a small number of consumers because the hidden gluten constitutes a hazard for people with celiac disease and gluten sensitivities. The protein content of some pet foods may also be enhanced by adding gluten. Gluten is also used in cosmetics, hair products and other dermatological preparations. "Gluten-related disorders" is the umbrella term for all diseases triggered by gluten, which include celiac disease (CD), non-celiac gluten sensitivity (NCGS), wheat allergy, gluten ataxia and dermatitis herpetiformis (DH). As of 2017[update], gluten-related disorders were increasing in frequency in different geographic areas. This can possibly be explained by one or more of the following: the growing westernization of diets, the increasing use of wheat-based foods included in the Mediterranean diet, the progressive replacement of rice by wheat in many countries in Asia, the Middle East, and North Africa, the development in recent years of new types of wheat with a higher amount of cytotoxic gluten peptides, and the higher content of gluten in bread and bakery products due to the reduction of dough fermentation time. Celiac disease (CD) is a chronic, multiple-organ autoimmune disorder primarily affecting the small intestine caused by the ingestion of wheat, barley, rye, oats, and derivatives, that appears in genetically predisposed people of all ages. CD is not only a gastrointestinal disease, because it may involve several organs and cause an extensive variety of non-gastrointestinal symptoms, and most importantly, it may be apparently asymptomatic. Many asymptomatic people actually are not, but have become accustomed to living with a chronic bad health status as if it were normal, and they are able to recognize that they actually had symptoms related to celiac disease after starting the gluten-free diet and improvement is evident, in contrast to the situation prior to the diet. Added difficulties for diagnosis are the fact that serological markers (anti-tissue transglutaminase [TG2]) are not always present and many people may have minor mucosal lesions, without atrophy of the intestinal villi. CD affects approximately 1–2% of the general population, but most cases remain unrecognized, undiagnosed and untreated, and at risk for serious long-term health complications. People may suffer severe disease symptoms and be subjected to extensive investigations for many years, before a proper diagnosis is achieved. Untreated CD may cause malabsorption, reduced quality of life, iron deficiency, osteoporosis, an increased risk of intestinal lymphomas, and greater mortality. CD is associated with some other autoimmune diseases, such as diabetes mellitus type 1, thyroiditis, gluten ataxia, psoriasis, vitiligo, autoimmune hepatitis, dermatitis herpetiformis, primary sclerosing cholangitis, and more. CD with "classic symptoms", which include gastrointestinal manifestations such as chronic diarrhea and abdominal distention, malabsorption, loss of appetite, and impaired growth, is currently the least common presentation form of the disease and affects predominantly small children generally younger than two years of age. CD with "non-classic symptoms" is the most common clinical type and occurs in older children (over 2 years old), adolescents, and adults. It is characterized by milder or even absent gastrointestinal symptoms and a wide spectrum of non-intestinal manifestations that can involve any organ of the body, and very frequently may be completely asymptomatic both in children (at least in 43% of the cases) and adults. Non-celiac gluten sensitivity (NCGS) is described as a condition of multiple symptoms that improves when switching to a gluten-free diet, after celiac disease and wheat allergy are excluded. Recognized since 2010, it is included among gluten-related disorders, but its pathogenesis is not yet well understood. NCGS is the most common syndrome of gluten intolerance, with a prevalence estimated to be 6-10%. NCGS is becoming a more common diagnosis, but its true prevalence is difficult to determine because many people self-diagnose and start the gluten-free diet, without having previously tested for celiac disease or doctor's recommendations. People with NCGS and gastrointestinal symptoms remain habitually in a "no man's land", without being recognized by the specialists and lacking the adequate medical care and treatment. Most of these people have a long history of health complaints and unsuccessful consultations with numerous physicians, trying to get a diagnosis of celiac disease, but they are only labeled as irritable bowel syndrome. A consistent although undefined number of people eliminate gluten because they identify it as responsible for their symptoms and these improve with the gluten-free diet, so they self-diagnose as NCGS. People with NCGS may develop gastrointestinal symptoms, which resemble those of irritable bowel syndrome or wheat allergy, or a wide variety of non-gastrointestinal symptoms, such as headache, chronic fatigue, fibromyalgia, atopic diseases, allergies, neurological diseases, or psychiatric disorders, among others. The results of a 2017 study suggest that NCGS may be a chronic disorder, as is the case with celiac disease. Besides gluten, additional components present in wheat, rye, barley, oats, and their derivatives, including other proteins called amylase-trypsin inhibitors (ATIs) and short-chain carbohydrates known as FODMAPs, may cause NCGS symptoms.As of 2019, reviews conclude that although FODMAPs present in wheat and related grains may play a role in non-celiac gluten sensitivity, they only explain certain gastrointestinal symptoms, such as bloating, but not the extra-digestive symptoms that people with non-celiac gluten sensitivity may develop, such as neurological disorders, fibromyalgia, psychological disturbances, and dermatitis. ATIs may cause toll-like receptor 4 (TLR4)-mediated intestinal inflammation in humans. People can also experience adverse effects of wheat as result of a wheat allergy. As with most allergies, a wheat allergy causes the immune system to abnormally respond to a component of wheat that it treats as a threatening foreign body. This immune response is often time-limited and does not cause lasting harm to body tissues. Wheat allergy and celiac disease are different disorders. Gastrointestinal symptoms of wheat allergy are similar to those of celiac disease and non-celiac gluten sensitivity, but there is a different interval between exposure to wheat and onset of symptoms. An allergic reaction to wheat has a fast onset (from minutes to hours) after the consumption of food containing wheat and could include anaphylaxis. In addition to gluten ataxia, gluten sensitivity can cause a wide spectrum of neurological disorders, which develop with or without the presence of digestive symptoms or intestinal damage. These include peripheral neuropathy, epilepsy, headache, encephalopathy, vascular dementia, and various movement disorders (restless legs syndrome, chorea, parkinsonism, Tourette syndrome, palatal tremor, myoclonus, dystonia, opsoclonus myoclonus syndrome, paroxysms, dyskinesia, myorhythmia, myokymia). The diagnosis of underlying gluten sensitivity is complicated and delayed when there are no digestive symptoms. People who do experience gastrointestinal problems are more likely to receive a correct diagnosis and treatment. A strict gluten-free diet is the first-line treatment, which should be started as soon as possible. It is effective in most of these disorders. When dementia has progressed to an advanced degree, the diet has no beneficial effect. Cortical myoclonus appears to be treatment-resistant on both gluten-free diet and immunosuppression. Gliadin activates zonulin signaling in all people who eat gluten. This leads to increased intestinal permeability to macromolecules, allowing passage of foreign antigens, microbes, microbial products, and toxins between the enterocytes of the intestinal mucosa into the portal circulation and beyond, which can result in activation of the immune system with secretion of inflammatory mediators. Most people do not experience adverse effects, but an increased intestinal permeability can act as a trigger for diseases that can affect any organ or tissue, depending on genetic predisposition. The Codex Alimentarius international standards for food labeling has a standard relating to the labeling of products as "gluten-free". It only applies to foods that would normally contain gluten. By law in Brazil, all food products must display labels clearly indicating whether or not they contain gluten. The Canadian Celiac Association estimates that one in 133 Canadians experiences adverse symptoms from gluten in celiac disease. Labels for all food products sold in Canada must clearly identify the presence of gluten if it is present at a level greater than 20 parts per million. In the European Union, all prepackaged foods and non-prepacked foods from a restaurant, take-out food wrapped just before sale, or unpackaged food served in institutions must be identified if gluten-free. "Gluten-free" is defined as 20 parts per million of gluten or less and "very low gluten" is 100 parts per million of gluten or less; only foods with cereal ingredients processed to remove gluten can claim "very low gluten" on labels. In the United States, gluten is not listed on labels unless added as a standalone ingredient. Wheat or other allergens are listed after the ingredient line. The US Food and Drug Administration (FDA) has historically classified gluten as "generally recognized as safe" (GRAS). In August 2013, the FDA issued a final ruling, effective August 2014, that defined the term "gluten-free" for voluntary use in the labeling of foods as meaning that the amount of gluten contained in the food is below 20 parts per million. ^ a b c Food and Drug Administration (January 2007). "Food Labeling ; Gluten-Free Labeling of Foods" (PDF). ^ a b c d e f Shewry, P. R.; Halford, N. G.; Belton, P. S.; Tatham, A. S. (2002). "The structure and properties of gluten: An elastic protein from wheat grain". Philosophical Transactions of the Royal Society B: Biological Sciences. 357 (1418): 133–142. doi:10.1098/rstb.2001.1024. PMC 1692935. PMID 11911770. ^ "Gluten's role in bread baking performance". Canadian Grain Commission. 29 March 2016. ^ a b c Biesiekierski JR (2017). "What is gluten?". J Gastroenterol Hepatol (Review). 32 Suppl 1: 78–81. doi:10.1111/jgh.13703. PMID 28244676. Similar proteins to the gliadin found in wheat exist as secalin in rye, hordein in barley, and avenins in oats, and are collectively referred to as “gluten.” The gluten found in all of these grains has been identified as the component capable of triggering the immune-mediated disorder, coeliac disease. ^ a b Day L, Augustin MA, Batey IL, Wrigley, CW (February 2006). "Wheat-gluten uses and industry needs". Trends in Food Science & Technology (Review). 17 (2): 82–90. doi:10.1016/j.tifs.2005.10.003. Given the unique properties of wheat gluten, it is not surprising that it has been the subject of intense attention by the food industry. (...) Gluten does have economic benefits over and above the more expensive milk- or soy-protein products (Table 1), and its functional properties, which other products cannot duplicate, give it a unique place among the various protein products. (...) Unlike whey and soy proteins, gluten or wheat proteins are not high in biological value and have not been widely researched for nutritional advantages. ^ Payne, P. I. (2012-12-06). "Endosperm Proteins". In Blonstein, A. D.; King, P. J. (eds.). A Genetic Approach to Plant Biochemistry. Springer Science & Business Media. p. 210. ISBN 9783709169896. ^ a b c Lundin KE, Wijmenga C (Sep 2015). "Coeliac disease and autoimmune disease-genetic overlap and screening". Nat Rev Gastroenterol Hepatol. 12 (9): 507–15. doi:10.1038/nrgastro.2015.136. PMID 26303674. ^ a b Molina-Infante J, Santolaria S, Montoro M, Esteve M, Fernández-Bañares F (2014). "[Non-celiac gluten sensitivity: a critical review of current evidence] [Article in Spanish]". Gastroenterol Hepatol. 37 (6): 362–71. doi:10.1016/j.gastrohep.2014.01.005. PMID 24667093. ^ a b c Ludvigsson JF, Leffler DA, Bai JC, Biagi F, Fasano A, Green PH, Hadjivassiliou M, Kaukinen K, Kelly CP, Leonard JN, Lundin KE, Murray JA, Sanders DS, Walker MM, Zingone F, Ciacci C (January 2013). "The Oslo definitions for coeliac disease and related terms". Gut (Review). 62 (1): 43–52. doi:10.1136/gutjnl-2011-301346. PMC 3440559. PMID 22345659. ^ Lanza G, Bella R, Cantone M, Pennisi G, Ferri R, Pennisi M (July 2018). "Cognitive Impairment and Celiac Disease: Is Transcranial Magnetic Stimulation a Trait d'Union between Gut and Brain?". Int J Mol Sci (Review). 19 (8). doi:10.3390/ijms19082243. PMC 6121508. PMID 30065211. ^ Comino I, Moreno Mde L, Sousa C (Nov 7, 2015). "Role of oats in celiac disease". World J Gastroenterol. 21 (41): 11825–31. doi:10.3748/wjg.v21.i41.11825. PMC 4631980. PMID 26557006. It is necessary to consider that oats include many varieties, containing various amino acid sequences and showing different immunoreactivities associated with toxic prolamins. As a result, several studies have shown that the immunogenicity of oats varies depending on the cultivar consumed. Thus, it is essential to thoroughly study the variety of oats used in a food ingredient before including it in a gluten-free diet. ^ a b Sakhare, S. D.; Inamdar, A. A.; Soumya, C; Indrani, D; Rao, G. V. (2013). "Effect of flour particle size on microstructural, rheological and physico-sensory characteristics of bread and south Indian parotta". Journal of Food Science and Technology. 51 (12): 4108–4113. doi:10.1007/s13197-013-0939-5. PMC 4252461. PMID 25477689. ^ Woychick, JH; et al. "The Gluten Proteins and Deamidated Soluble Wheat Protein". Retrieved 8 September 2009. ^ Sahlstrom, S. & Brathen, E. (1997). "Effects of enzyme preparations for baking, mixing time and resting time on bread quality and bread staling". Food Chemistry, 58, 1, 75–80. Effects of wheat variety and processing conditions in experimental bread-baking studied by univariate and multivariate analysis. ^ Edwards, N. M.; Mulvaney, S. J.; Scanlon, M. G.; Dexter, J. E. (2003). "Role of gluten and its components in determining durum semolina dough viscoelastic properties". Cereal Chemistry. 80 (6): 755–763. doi:10.1094/CCHEM.2003.80.6.755. Retrieved 2007-08-14. ^ Tosi, Paola; Masci, Stefania; Giovangrossi, Angela2; D'Ovidio, Renato; Bekes, Frank; Larroque, Oscar; Napier, Johnathan; Shewry, Peter (September 2005). "Modification of the Low Molecular Weight (LMW) Glutenin Composition of Transgenic Durum Wheat: Effects on Glutenin Polymer Size and Gluten Functionality". Molecular Breeding. 16 (2): 113–126. doi:10.1007/s11032-005-5912-1. Retrieved 2007-08-14. ^ a b "Baking Technology, Bread". Bakersassist. Retrieved 2007-08-14. ^ "Farinograph". Wheat Quality and Carbohydrate Research. North Dakota State University. 22 September 2014. Retrieved 8 December 2014. ^ Oliver, JR; Allen, HM (January 1992). "The prediction of bread baking performance using the farinograph and extensograph". Journal of Cereal Science. 15 (1): 79–89. doi:10.1016/S0733-5210(09)80058-1. ^ Amendola, J.; Rees, N.; Lundberg, D. E. (2002). Understanding Baking. ^ "Against the Grain". The New Yorker. 3 November 2014. Retrieved 8 December 2014. ^ Abramowski, Nicole (11 March 2011). "How to Make Seitan: An Illustrated Guide". Vegan Nom Noms. Retrieved 8 December 2014. ^ "Pet Foods". International Wheat Gluten Association. Archived from the original on 2007-10-07. Retrieved 14 August 2007. ^ Humbert P; Pelletier F; Dreno B; Puzenat E; Aubin F (2006). "Gluten intolerance and skin diseases". Eur J Dermatol. 16 (1): 4–11. PMID 16436335. ^ a b c Leonard MM, Sapone A, Catassi C, Fasano A (2017). "Celiac Disease and Nonceliac Gluten Sensitivity: A Review". JAMA (Review). 318 (7): 647–656. doi:10.1001/jama.2017.9730. PMID 28810029. Previous studies have shown that gliadin can cause an immediate and transient increase in gut permeability. This permeating effect is secondary to the binding of specific undigestible gliadin fragments to the CXCR3 chemokine receptor with subsequent release of zonulin, a modulator of intercellular tight junctions. This process takes place in all individuals who ingest gluten. For the majority, these events do not lead to abnormal consequences. However, these same events can lead to an inflammatory process in genetically predisposed individuals when the immunologic surveillance system mistakenly recognizes gluten as a pathogen. ^ a b c Tovoli F, Masi C, Guidetti E, Negrini G, Paterini P, Bolondi L (Mar 16, 2015). "Clinical and diagnostic aspects of gluten related disorders". World J Clin Cases (Review). 3 (3): 275–84. doi:10.12998/wjcc.v3.i3.275. PMC 4360499. PMID 25789300. ^ a b c Lionetti E, Gatti S, Pulvirenti A, Catassi C (Jun 2015). "Celiac disease from a global perspective". Best Pract Res Clin Gastroenterol (Review). 29 (3): 365–79. doi:10.1016/j.bpg.2015.05.004. PMID 26060103. ^ Belderok B (2000). "Developments in bread-making processes". Plant Foods Hum Nutr (Review). 55 (1): 1–86. doi:10.1023/A:1008199314267. PMID 10823487. ^ Gobbetti M, Giuseppe Rizzello C, Di Cagno R, De Angelis M (Apr 2007). "Sourdough lactobacilli and celiac disease". Food Microbiol (Review). 24 (2): 187–96. doi:10.1016/j.fm.2006.07.014. PMID 17008163. ^ a b "Celiac disease". World Gastroenterology Organisation Global Guidelines. July 2016. Retrieved 23 April 2017. ^ a b c d e f Ludvigsson JF, Card T, Ciclitira PJ, Swift GL, Nasr I, Sanders DS, Ciacci C (Apr 2015). "Support for patients with celiac disease: A literature review". United European Gastroenterol J. 3 (2): 146–59. doi:10.1177/2050640614562599. PMC 4406900. PMID 25922674. ^ a b Fasano, A; Catassi, C (Dec 20, 2012). "Clinical practice. Celiac disease". The New England Journal of Medicine. 367 (25): 2419–26. doi:10.1056/NEJMcp1113994. PMID 23252527. ^ a b c d Fasano A (Apr 2005). "Clinical presentation of celiac disease in the pediatric population". Gastroenterology. 128 (4 Suppl 1): S68–73. doi:10.1053/j.gastro.2005.02.015. PMID 15825129. ^ a b c Elli L, Branchi F, Tomba C, Villalta D, Norsa L, Ferretti F, Roncoroni L, Bardella MT (Jun 2015). "Diagnosis of gluten related disorders: Celiac disease, wheat allergy and non-celiac gluten sensitivity". World J Gastroenterol. 21 (23): 7110–9. doi:10.3748/wjg.v21.i23.7110. PMC 4476872. PMID 26109797. ^ a b Lebwohl B, Ludvigsson JF, Green PH (Oct 2015). "Celiac disease and non-celiac gluten sensitivity". BMJ (Review). 351: h4347. doi:10.1136/bmj.h4347. PMC 4596973. PMID 26438584. ^ a b Lundin KE, Wijmenga C (Sep 2015). "Coeliac disease and autoimmune disease-genetic overlap and screening". Nat Rev Gastroenterol Hepatol. 12 (9): 507–15. doi:10.1038/nrgastro.2015.136. PMID 26303674. ^ Vriezinga SL, Schweizer JJ, Koning F, Mearin ML (Sep 2015). "Coeliac disease and gluten-related disorders in childhood". Nature Reviews. Gastroenterology & Hepatology (Review). 12 (9): 527–36. doi:10.1038/nrgastro.2015.98. PMID 26100369. ^ a b c d Catassi C, Bai JC, Bonaz B, Bouma G, Calabrò A, Carroccio A, Castillejo G, Ciacci C, Cristofori F, Dolinsek J, Francavilla R, Elli L, Green P, Holtmeier W, Koehler P, Koletzko S, Meinhold C, Sanders D, Schumann M, Schuppan D, Ullrich R, Vécsei A, Volta U, Zevallos V, Sapone A, Fasano A (Sep 2013). "Non-Celiac Gluten sensitivity: the new frontier of gluten related disorders". Nutrients. 5 (10): 3839–53. doi:10.3390/nu5103839. PMC 3820047. PMID 24077239. ^ a b c d e Fasano A, Sapone A, Zevallos V, Schuppan D (May 2015). "Nonceliac gluten sensitivity". Gastroenterology. 148 (6): 1195–204. doi:10.1053/j.gastro.2014.12.049. PMID 25583468. ^ Czaja-Bulsa G (Apr 2015). "Non coeliac gluten sensitivity - A new disease with gluten intolerance". Clin Nutr. 34 (2): 189–94. doi:10.1016/j.clnu.2014.08.012. PMID 25245857. ^ Igbinedion SO, Ansari J, Vasikaran A, Gavins FN, Jordan P, Boktor M, Alexander JS (Oct 2017). "Non-celiac gluten sensitivity: All wheat attack is not celiac". World Journal of Gastroenterology (Review). 23 (20): 7201–7210. doi:10.3748/wjg.v23.i40.7201. PMC 5677194. PMID 29142467. ^ a b c Verdu EF, Armstrong D, Murray JA (2009). "Between celiac disease and irritable bowel syndrome: the "no man's land" of gluten sensitivity". Am J Gastroenterol (Review). 104 (6): 1587–94. doi:10.1038/ajg.2009.188. PMC 3480312. PMID 19455131. ^ a b Mansueto, Pasquale; Seidita, Aurelio; D'Alcamo, Alberto; Carroccio, Antonio (2014). "Non-Celiac Gluten Sensitivity: Literature Review" (PDF). Journal of the American College of Nutrition (Review). 33 (1): 39–54. doi:10.1080/07315724.2014.869996. hdl:10447/90208. ISSN 0731-5724. PMID 24533607. ^ Elli L, Roncoroni L, Bardella MT (Jul 2015). "Non-celiac gluten sensitivity: Time for sifting the grain". World J Gastroenterol (Review). 21 (27): 8221–6. doi:10.3748/wjg.v21.i27.8221. PMC 4507091. PMID 26217073. ^ Verbeke, K (February 2018). "Nonceliac Gluten Sensitivity: What Is the Culprit?". Gastroenterology. 154 (3): 471–473. doi:10.1053/j.gastro.2018.01.013. PMID 29337156. Although intolerance to fructans and other FODMAPs may contribute to NCGS, they may only explain gastrointestinal symptoms and not the extraintestinal symptoms observed in NCGS patients, such as neurologic dysfunction, psychological disturbances, fibromyalgia, and skin rash.15 Therefore, it is unlikely that they are the sole cause of NCGS. ^ "What's the difference between celiac disease, gluten intolerance, non-celiac gluten sensitivity and wheat allergy?". The University of Chicago Celiac Disease Center. 2015. Retrieved 4 January 2015. ^ "Food intolerance and coeliac disease" (PDF). Food Standards Agency. September 2006. Retrieved 8 September 2009. ^ Vinagre-Aragón A, Zis P, Grunewald RA, Hadjivassiliou M (2018). "Movement Disorders Related to Gluten Sensitivity: A Systematic Review". Nutrients (Review). 10 (8). doi:10.3390/nu10081034. PMC 6115931. PMID 30096784. ^ a b c Fasano A (Jan 2011). "Zonulin and its regulation of intestinal barrier function: the biological door to inflammation, autoimmunity, and cancer". Physiol. Rev. (Review). 91 (1): 151–75. CiteSeerX 10.1.1.653.3967. doi:10.1152/physrev.00003.2008. PMID 21248165. ^ a b Suzuki, Takuya (2013-02-01). "Regulation of intestinal epithelial permeability by tight junctions". Cellular and Molecular Life Sciences. 70 (4): 631–659. doi:10.1007/s00018-012-1070-x. ISSN 1420-682X. PMID 22782113. ^ "General labeling for Packaged Foods (free translation)". ANVISA. July 2014. ^ "About celiac disease". Canadian Celiac Association. 2014. ^ "Health Canada's Position on Gluten-Free Claims". Health Canada. 29 June 2012. Retrieved 28 January 2015. ^ a b "Labelling of 'gluten free' foods" (PDF). Food Standards Agency. 31 October 2016. ^ "Questions and Answers: Gluten-Free Food Labeling Final Rule". US Food and Drug Administration. 5 August 2014. Retrieved 4 January 2015. Curtis, B.C. ; Rajaram, S.; Macpherson, H.G. "Bread Wheat, Improvement and production — FAO Plant Production and Protection Series No. #30". Retrieved 2007-08-21. Pfluger, Laura. "Marker Assisted Selection in Wheat, Quality traits. Gluten Strength, Coordinated Agricultural Project (funded by USDACREES)". Retrieved 2007-09-29.